This website and this blog have been around long enough now (over 15 years and nearly 7 years, respectively) to have witnessed the ongoing evolution and refinement of certain concepts in the neurosciences. We all know that science evolves, but it can be interesting to see how. That’s what I’d like to show today, using an example of conceptual evolution. This example relates to the amygdalae—the two almond-shaped groups of neuronal nuclei on either side of the brain that were associated with human fear reactions very early in the history of neuroscience. Indeed, studies such as those by Joseph LeDoux have shown that when a threatening stimulus is presented to rats or humans, the neurons in each amygdala in their brains become highly active. But as brain-imaging studies became more common, they showed that the activity in someone’s amygdala could also increase in other situations as well (for example, when that person was extremely hungry or saw a loved one suffering). Scientists therefore began to hypothesize that the activity in these brain circuits had more to do with a strong concern about something that affected the individual’s survival directly or indirectly. The fact that in each of the three situations just cited, there is also activity in other brain structures, and that different structures are involved in each case, would explain the different subjective feelings associated with each of them. 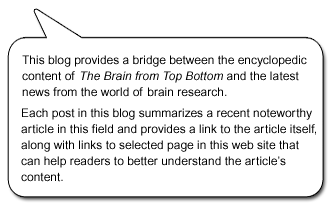 As this site and blog have stressed many times, there is no “center” for anything in the brain. Everything that happens in it involves collaboration among several areas of the brain that differ in their computational capacity but rarely specialize in a single psychological function. In an article published in the journal Trends in Cognitive Sciences in May 2017, Joseph LeDoux offers another caution about the human brain’s unique capability to be studied both from the outside (“objectively”, in the third person, to describe neuronal mechanisms and behaviour) and from the inside (“subjectively”, in the first person, to describe life as experienced by an individual and reported by that individual verbally). LeDoux’s caution is basically very simple: beware of taking words that are commonly used to describe a subjective state (such as fear) and applying these same words to describe behaviours or the brain circuits that control them (very often unconsciously), because if you do, you may unfortunately cause these brain circuits to take on properties associated with this state, often resulting in a lot of confusion. The same problem was cited recently by Michael Petrides (page 136 of this pdf) with regard to some “functional labels” that had slipped into the most recent map of the brain published in the journal Nature in summer 2016 by Matthew Glasser and his team. So, to come back to the amygdala: the activation of this brain structure does not “cause” fear. Fear is a conscious subjective feeling in which many different brain structures are involved, in particular the prefrontal cortex, whose circuits contribute to working memory and other “executive” functions (such as attention and planning). LeDoux recognizes that the classic “implicit/explicit” distinction regarding an emotion such as fear, which made it possible to distinguish between the unconscious aspect of the amygdala’s work and the conscious work of the cortex, leads to confusion because of the excessively strong conscious connotation of the functional label “fear”. 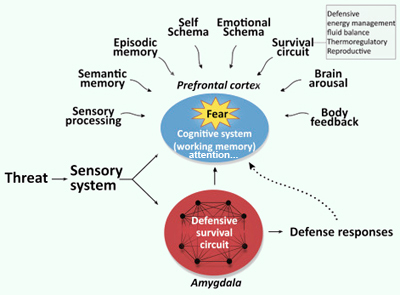 He therefore proposes that from now on, when we talk about the amygdala, we use the term “defensive survival circuits” rather than “fear circuits”, and confine our use of the word “fear” to describe the common, readily identifiable subjective experience in question.